Well, like many others, it is incumbent upon me to post an obligatory 4th of July post. This year I actually have some things to write about. Bryan, Sara, the boys, and Scott’s parents came over to share a barbeque meal with us to celebrate the birth of our nation. 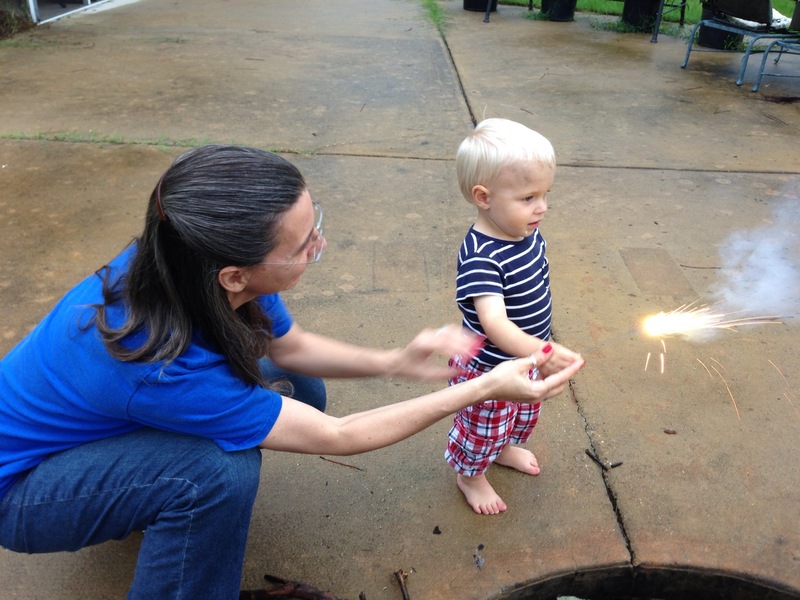 Our celebrations included the presentation of Bryan’s long awaited freedom quilt (the one i couldn’t show you last post), making sugar cookies shaped like stars, successfully lighting a fire in the pit with very wet wood and, finally, sparklers for the boys. I named Bryan’s freedom quilt “Freedom’s Pillars.” because on the front of the quilt, I embroidered virtues that I deemed necessary for a society to remain free. 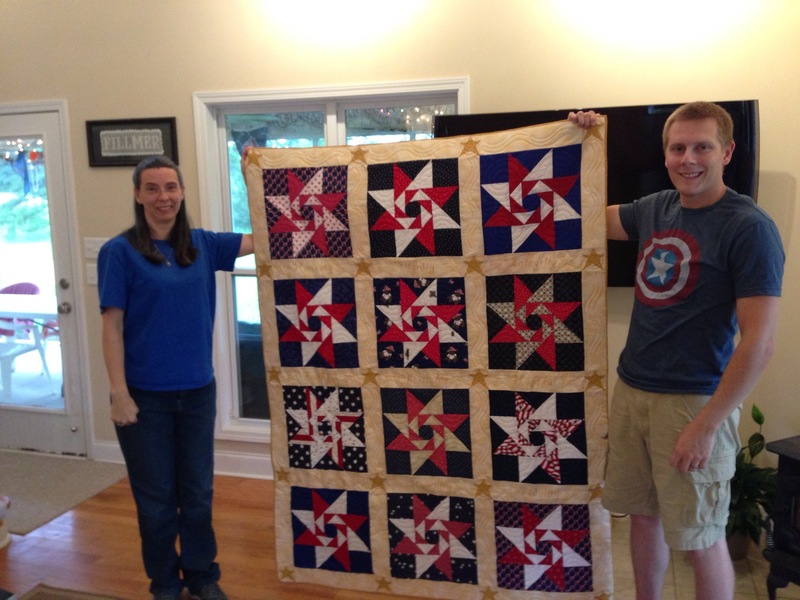 This quilt was supposed to be presented to him when he attained his “freedom” from his parent’s home and moved out on his own, but life is complicated and things don’t always happen as planned. So, here is the quilt and it’s presentation. I really hope he will cherish it and pass it (along with the virtues it connotes) to his sons and beyond. 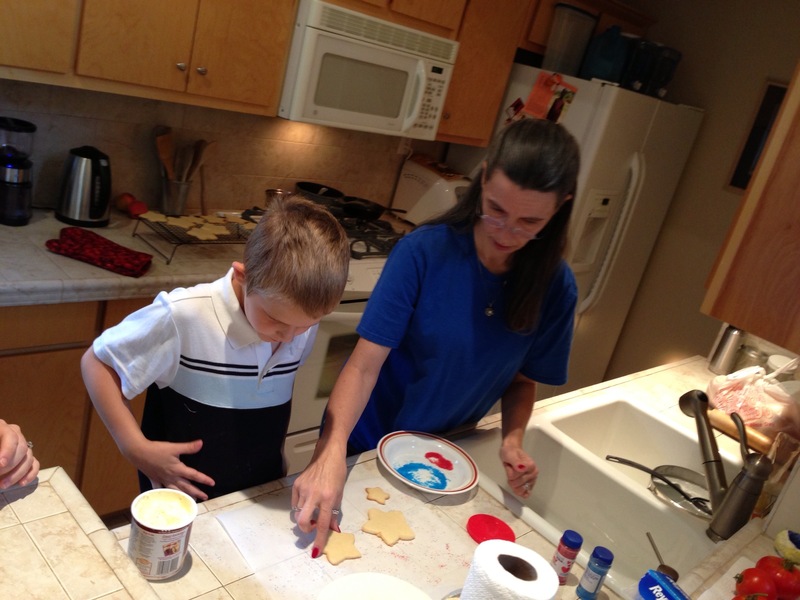 While William helped Sara and I bake sugar cookies, Luke tried out Popo’s shoes. 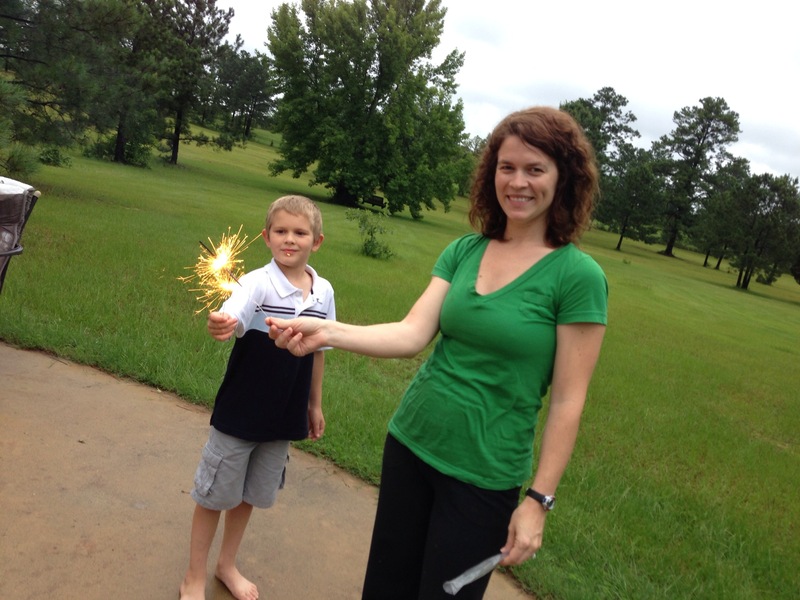 Finally, after barbeque and all the fixings, we played with sparklers around the fire pit. We are considering fireworks for next year. Love it! 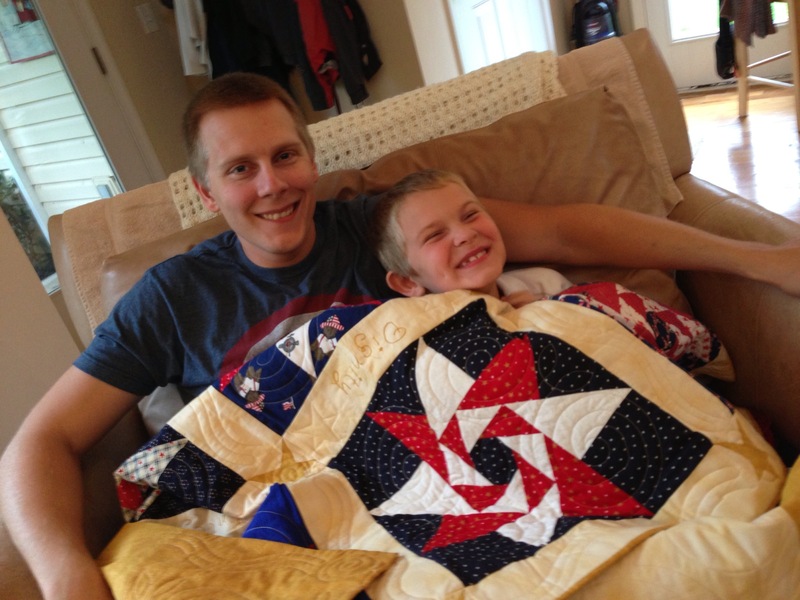 The family; the quilt; all of it! YOU look happy! 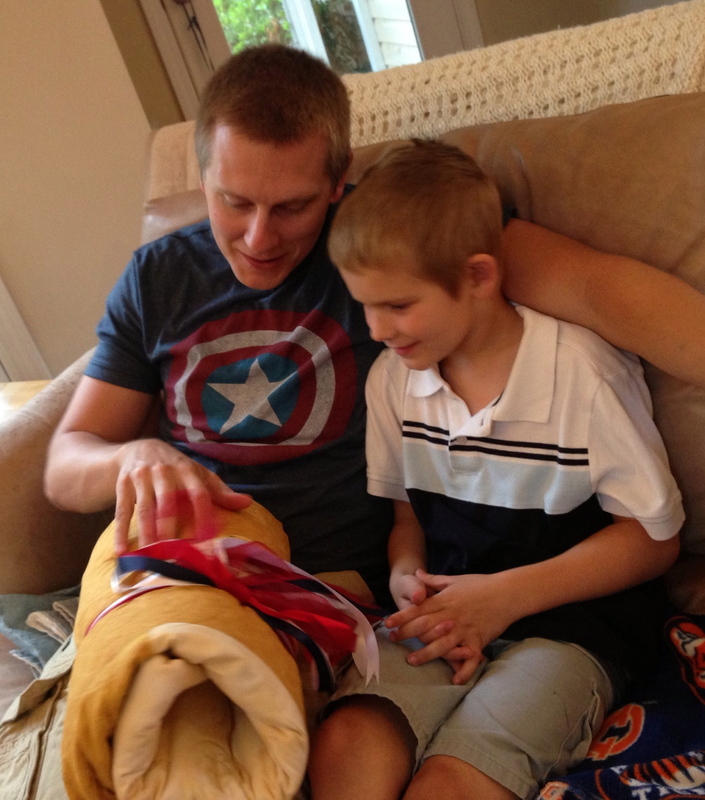 I used the quilt last night to help get Luke nice and sleepy for bedtime.